So there’s always been lots of talk (and perhaps somewhat less action :) ) about how virtual worlds are potentially great delivery vehicles for education, and schools, and museums, and all like that there. There are a number of different ways to approach the idea, from wild “pretty much Not Possible In Real Life” things like that amazing and/or disturbing Virtual Schizophrenia build from the other year, to simple “upload my 2D art and put it on the walls of a virtual room” galleries, to novel interactive things that are about other things and that are yet to be built. The machinima is very well done, and if for some reason you can’t get to the museum itself, by all means watch it. But if you can get to the museum yourself, I’d suggest doing that first! Or at least second. :) I went the other day (and then got sick and almost forgot that I’d wanted to weblog about it), and am glad I did. I knew nothing about Peter Vos before visiting the museum, and now I feel both fascinated and well-informed, as well as having come home with some nice souvenirs. The museum is a lovely build, perfectly fit to the purpose, and taking advantage of the SL environment in subtle but effective ways; the lighting is dark with focused lights, as a museum should be, the synchronized slide projectors are definitely synchronized slide projectors, making just the right soft sounds, the little peepholes that let you examine some of the smaller works close up are perfect little peepholes, that zoom your default camera position right in where it ought to be, while making your avatar bend in just the right “museum visitor peering into one of those little peepholes” pose. About the art itself I won’t say much; it should be experienced. :) Nothing conventional, many many birds, and considerable surreality. I would commend this both to anyone as a museum to be visited, and to anyone thinking of building a virtual museum (or gallery, or school, or…) as an example of one very effective way to do it. It’s just one point in the (big!) space of possible approaches, but it’s a very well done one, and definitely worth a visit. Despite the silly atomic body being busy fighting off some “cold germ” sort of replicators, I managed to make a New Year card! And this is it here! 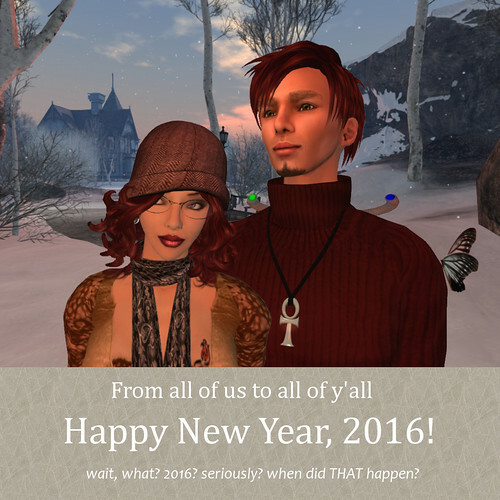 It’s been a nice low-key sort of year in SL (at least to the extent I’m willing to publicly divulge, mu-hahaha). Lots of things have happened in the world, and I have for the most part just sat (or flown or danced) in more or less my usual places, and smiled benignly at the thought that other people were doing them. Also I have not written in my weblog much. :) But I am still here! 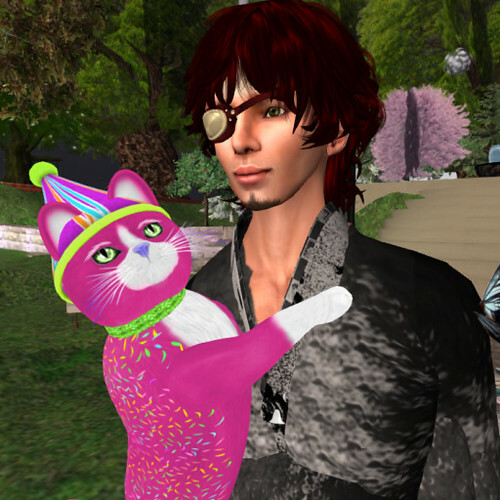 And still infinitely appreciative of my SL friends, creators, people in AVs normal and lovely and ugly and wild, who make the world the amazing thing it is. Girl Dale notes that her hair actually looks much better than that, and the “capture depth” feature of the viewer camera works with limited success in the presence of alphas. I have hardly existed at all for some time, as my atomic counterpart claims to have been “out of the country” and to have “jetlag” and “a plugged ear” and all sorts of unlikely-sounding ailments of that kind. When I have been in, I have been mostly (a) checking the riotvends and lucky boards at Sn@tch (see above), (b) sorting inventory, and (c) now and then going to sets by ‘leet DJs. None of which have inspired me to weblog about them much! But here is a neat thing, that I can claim some connection to: Karima and Nat have posted on their entry for this year’s UWA Machinima contest (with the very SL-ish theme of “Transcending Borders”), and you can see it on the web and leave comments and stuff (Karima also says some Wise Things about the Culture of Easy Likes, which should be read and commented on). For this film, I got to gallop about as a horse some (see the amazing scenes with horses emerging from water and walking on tabletops and such), and I helped a little with some of the “data flowing” effects; also it includes inter alia some memes and clips from prior films of theirs, some of which I also did scripting and/or galloping about as a horse and so on in. And it is a great film, perfectly on-theme and very worth watching.